Payment Shipping Additional Information Flapper Ladys Crochet Crocheted Cloche Hat Pattern 1935 Flapper Era Lady's Fancy Crocheted Hat Pattern! Dakota Prairie Treasures Hardcopy Republication? Originally Published c1920! Receive a 50% s/h discount on all items in your order after the first purchase, providing all are paid for in a single payment! Up for bid is another marvelous Dakota Prairie Treasures Hardcopy Republication? 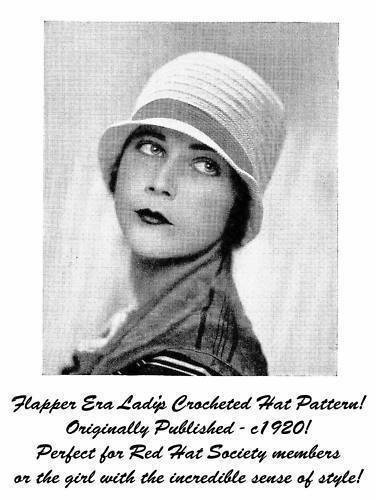 for an Authentic Flapper Era Lady's Crochet Lace Hat Pattern! What could be more darling for millinery historical reenactment than this chic hat? An Authentic Antique Lady's Dress Hat Pattern in Crochet for you to recreate! As you can see this hat is striking lovely and has the potential to be customized however your needlework muse desires! The instructions states the color used was shades of green but imagine making it in classic black and gold to go with that dangerous little black dress? Or in RED for your RED HAT SOCIETY mettings? Of course though you can use any colors your heart desires! Pretty for you, pretty for gifts and pretty for posterity! (Original is not for sale) This item is a great resource for those who are Flapper and Retro Era historical reenactment enthusiasts, stage and theatre costumers, students of historical clothing, fiber and textile arts, etc! These certainly also have a decidedly Victorian and Edwardian feel! Imagine what a marvelously unique accessory this could be for the prom, a wedding (whether for the bride, mother of the bride, matron of honor, or bridesmaids), clubbing dates, the office, etc! The ladies of earlier times put their hands to such marvelous work and now you can too! This is a beautiful item and sure to delight you and yours! The instructions are very clear and easy to follow and yet the experience needle worker will be capable of altering as per individual needs and artistic whim. The antique and vintage threads, hooks, etc., can be found quite readily. You just have to hunt a little bit! :) Or, of course, you can utilize contemporary tools and materials found at a nearby fabric, craft or hobby store? Check out Dakota Prairie Treasures' current auctions and store listings for many other unique needlework Hardcopy, CD and Electronic Republications? for your creative needle working pleasure! The item you will receive is representative of the types of needlework expertise of earlier genteel and feminine American culture! If you're into nostalgia like I am you will have hours of enjoyment making and recreating this antique needlework items for yourself or others dear to your heart just the way your great-grandmothers did! What are the benefits of a Dakota Prairie Treasures Hardcopy Republication?? * Every image and every page has been scanned at a high dpi to produce crystal clear images and you never have to deal with any crumbling old paper! * No having to purchase excessively expensive hard-to-obtain originals. * No handling old and crumbling originals. Payment: I prefer Paypal. Shipping: Within the United States: 2.79 USPS. Out-of-country (including Canada): 3.79. Copyright restrictions: All Dakota Prairie Treasures products, designs images are manufactured, copyrighted owned by us (as is all listing text photos). All Dakota Prairie Treasure designs or images, or any part thereof, may NOT be reproduced, used in lessons or duplicated in any media format to be resold or "shared" (either individually, as a package, as machine embroidery products, etc.) without Dakota Prairie Treasures prior written consent. You are permitted to use our products' information for needlecraft items you make for yourself, as gifts, or for items you may produce to sell. However, the original designs images remain the exclusive legal property of Dakota Prairie Treasures. Any all violations will be prosecuted to the fullest extent of the law. Returns are allowed for replacement on DPT products due to manufacturing defects only.